You may have noticed some red and white “no parking” signs on or near Beacon Avenue south of the library recently. City workers are trimming the trees along that stretch today and tomorrow, ensuring that they don’t interfere with electrical or other utility lines. 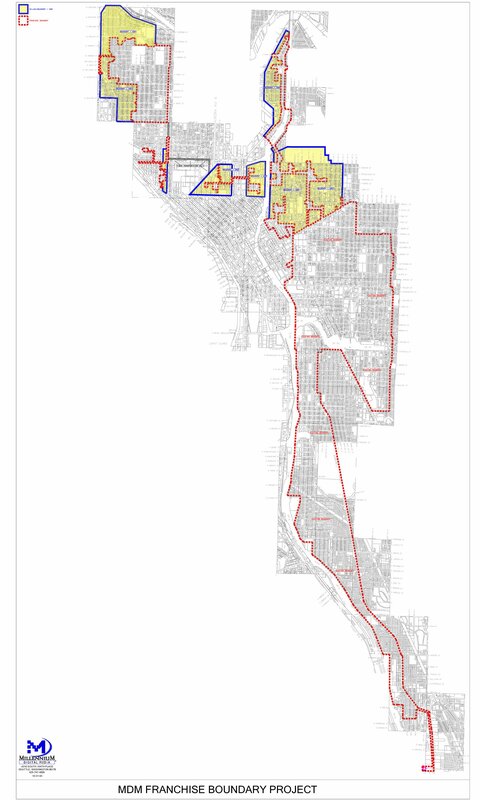 Broadstripe (formerly Millennium Digital Media), cable television, internet, and telephone provider for a large portion of Beacon Hill, the entire Central Area, and parts of Capitol Hill and Queen Anne (inside the dashed red lines), has filed for Chapter 11 bankruptcy protection. The local Broadstripe office confirmed the filing and will send us formal notification. We will meet with them as soon as is feasible. Broadstripe also confirmed its commitment to continue providing service to Seattle customers with no interruptions during the financial restructuring. We will monitor customer calls to the Cable Office to confirm that service does not suffer. This action was apparently taken back at the beginning of January, according to the city website. I wonder if this might light a fire under the development of a municipal cable or fiber deployment like Tacoma has with their Click! Network. A city task force concluded in 2005 that “in order to remain competitive, Seattle needs fiber-optic lines to the home.” As of last spring, the city was still looking for a partner to help build and run such a system.